Alright, alright, so this is completely a love / hate affair with this record. It has nothing to do with the music or the sound quality; basically, I did not get the record at first (you know like understand it at all). Then summarily dismissed the Sailors With Wax Wings as simply OK but nothing that completely blew my mind or made me come back to listen to the album again for a while, which relegated the album to sitting in my stack a bit before giving the record a real good listen. Big mistake on my part because this record is simply gorgeous sounding, even with all the different voices (both human and instrument) vying for attention; this may be the most dense sounding pop record since My Bloody Valentine’s Loveless in terms of how much sound is crammed into every measure of music. Lush atmospheric textures are penetrated with soaring guitar leads and seemingly codeine laced male and female vocal parts and pushed through a somewhat pop prism to create this album, but while sounding extremely poppy, <i>Sailors With Wax Wings</i> is not simply another riff on the shoegaze and dream pop formula. There is a great deal of difficulty in separating one song from another (not in a bad way) as the album flows extremely well, and while it might cause narcoleptic fits (like some medications do not listen to this while driving or operating heavy machinery) Sailors With Wax Wings is a delightful eight pieces with which to relax; I think the album is a bit out of season as it seems more a warm summer afternoon record (when you are at your drowsiest) instead of a cold, blustery morning record. Listening to tracks like “Strange That I Should Have Grown So Suddenly Blind” and “There Comes A Drooping Maid With Violets” remind me every time that I hear them that beautiful music can still be made. One of several side projects of R. Loren (of Pyramids), Sailors With Wax Wings contains a guest or collaborator list that seemingly goes on forever with people lending their talents such as Ted Parsons (Swans, Godflesh, Jesu, etc. ), Simon Scott (Slowdive), Aidan Baker (Nadja), Colin Marston (Krallice), Dominick Furnow (Prurient, Cold Cave), and tons more. The birthplace of this project is equally crazy sounding, but I will leave that story for other people to tell who have more space and time. 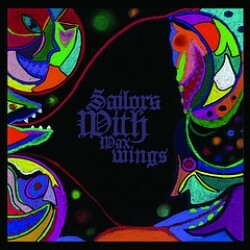 In truth, this is a well executed album which will have listeners sitting awash in its sound while their bodies tingle is a certain achievement that delivers on some levels while falling short in others; wholly worth hearing and acquiring, this debut slab from Sailors With Wax Wings is quite a first record that will delight others while leaving others wondering what all the hype is about for the album. Posted Feb. 21, 2011, 1:27 a.m.